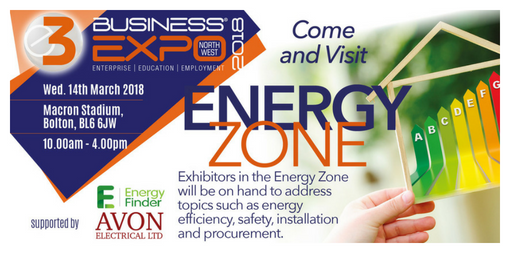 On Wednesday 14th March, the E3 Business Expo 2018 will feature an Energy Zone, where business owners and managers can obtain free advice from a gathering of experts in energy efficiency, safety, installation and procurement. The E3 Business Expo will be held at the Macron Stadium in Bolton between 10am and 4pm. It will feature a series of business seminars, speed networking opportunities and an exhibition area with over 70 stands. Entry is free. The exhibition hall will feature a series of separately themed zones focusing on important commercial issues such as fleet management, sales and marketing, business networking and, of course, energy. Exhibitors in the Energy Zone will be working together to offer comprehensive advice on all aspects of energy cost reduction. Visitors will be able to request utility supplier comparisons, energy efficiency surveys and reviews, as well as information on a whole raft of energy efficient lighting products. Delegates can also call on the experience of professional installers to discuss the costs and savings associated with a broad range of modern energy-efficient technologies. Although the exhibitors will be operating as a single advisory team, the individual companies will also have their own stalls where they can provide more detailed information about their respective specialisms. Exhibitors will offer advice on the potential benefits of technologies such as PIR, occupancy detectors and timers. One of them, Avon Electrical, is an experienced electrical contractor with particular expertise in energy efficient lighting, and heating systems for commercial and industrial premises. It will be on hand to discuss installation matters and related issues such as utility metering, wiring tests and legal compliance. Also exhibiting will be Energy Finder – a utility procurement broker and price comparison specialist that can help firms to cut the costs of electricity, gas, water, telecoms and fuels – such as red and white diesel and kerosene. It will be offering advice on energy surveys, how to reclaim over-payments on utility bills, and ways to reduce core production costs. “This is the first year that we’ll be featuring an Energy Zone,” said Mubarak Chati, managing director of 1 Events Media, the company which hosts and organises the Expo. “It’s a logical addition to the event; utility costs keep on rising and they’re a significant burden for many businesses, so that’s one of the key issues on which we want to make sure visitors can get help. In addition to covering energy-related issues, the Expo will feature a series of seminars addressing topics including fleet management, customer engagement and building effective business relationships.